Fleet Feet Hoboken is proud to serve as one of the leading participating sponsors for the major road races held in Hoboken each year. From March through October, you'll have the opportunity to participate in numerous races that begin and end in or near Hoboken's Pier A Park and feature scenic Hudson River views of the Manhattan skyline. These local races are a good opportunity to put your training to the test and support active local charities and organizations! Absolutely no refunds. Race held rain or shine. Fees: $25 by 4/22; $35 by 4/26; $40 on race day. Please note: Online registration is currently closed, however you can register the day of the race beginning at 8:30am. Fee is until 4/18/2013. Fee is $50 after 4/18/13. Proceeds from the events will go directly into aiding NJ communities affected by Hurricane Sandy. The proceeds from the New Jersey Liberty Run Marathon and Fleet Week Festival will go directly into the New Jersey communities where it is needed the most. Registration: $25 - Online. In person registration available the day of the race starting at 7 am at Pier A for $30. The 5k run will benefit Stevens cross country and track & field programs. Choose from two exciting events. The Pump and Run tests your multisport ability, and gives competitors the chance to shave time off of their 5k run based on the number of bench presses accomplished. The other other option is to compete in the 5k run only. All proceeds go to The Wounded Warrior Project. PRE-EVENT: Every pre-registered runner receives a goody bag with free stuff! Pick up your race number and performance t-shirt in advance at Fleet Feet (604 Washington St) Saturday 7/13 (12-5 pm), Sunday 7/14 (12-5 pm) or Monday 7/15 (5-9 pm). It can also be picked up day-of at the starting line on Pier A @ 5pm. This race is a fun event and on a USATF certified course! All of the funds raised go to local outreach programs in schools in the tri-state and a student in the Philippines. Online Registration: $25 / 5k runner (before July 18th) and $10 / kid for the Kids Fun Run. Click HERE to sign up. $40 on race day. Online Registration: Click HERE to sign up. Online registration closes Thursday, September 19, 2013 @ 11:59 pm. Cost: $15 through 7/31, $20 through 8/31, $22.50 through 9/5, $25 through 9/20 and $30 on race day. Kids race begins at 11:00 AM on 2nd Street and Palisade Avenue and is a 1/2 mile run. Price is $8 through September 20th and $12 on race day. Registration & Packet Pick-Up begin at 8am. More info: Out & back, fast course; slight incline at beginning, downhill finish. Walkers welcome. Proceeds benefit The Cystic Fibrosis Center at St. Joseph’s Children’s Hospital. Comfort Zone is a free children’s bereavement camp for kids who lost a parent or sibling. We offer kids a safe place to grieve, heal and grow. The race will have fantastic views of down town New York City, the Freedom Tower, the Statue of liberty and you can help a grieving child. Online Registration: $30 / adult. Click HERE to sign up. You must register online by September 9th to receive an official event t-shirt. Leashed Dogs are also welcome for $5. Online Registration: Click HERE to sign up. Cost: $65 but use DISCOUNT CODE: FLEETFEET10 at check-out and receive 10% off. View the course layout / obstacles here. Cost: $22.50 through May 26th, $25 through July 26th, $28 through September 26th, $30 through October 22nd or when the race reaches capacity. 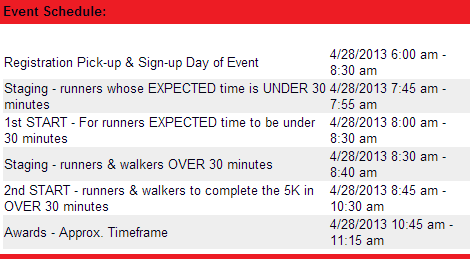 NOTE: No race day registration. Come to Feel Good World's first annual Santa Fun Run! All donations go to helping end world hunger. Dress up as Santa for a 2 mile run along the Hoboken pier. There will be prizes for children and adults for their respective races and maybe even a surprise special appearance from Santa Claus himself! Be part of the very first Hoboken Races Series! Run 4 of 5 local races during 2013 and get a special award for your achievement. Your participation will support very worthy Hoboken charities. See you at Pier A!